I was startled, but not surprised, (if that makes sense) to find bees in the trap of the drain as I finished up my dishes the other day. Yes, they were dead, and rather undefinable, but perhaps that's why I was startled when I recognized their dead identities. Through the warm up, Andrew opened up his beehives and discovered, to his disappointment, but not surprise, that all his little bugs had perished in the cold. 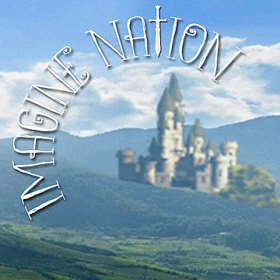 Dem bein' Californiee bees, I think day jes don't know bout U.P. win'ers. 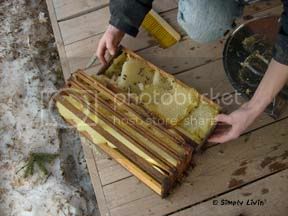 The ordinary operation of a beehive in the cold of winter, is to seal every crack and cranny of their hive with beeswax and then cluster for warmth around the queen in the bottom of the hive. They continually and politely rotate so that no'bee'dy gets too hot or cold. When they eat everything in the bottom box they slowly migrate upwards, eating as they go. The condensation that grows from their warmth on the hive box walls is their drink. Anyway, that's how it's supposed to BEE done. Apparently, nobody instructed our bees. They were all spread out throughout the hive... dead. 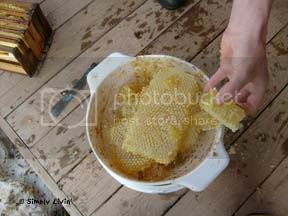 Sad as it was, it left us with a lot of honey because they hadn't eaten hardly any. Andrew says he's going to try again. As long as the bees are still paying themselves off with the honey and Andrew's time is still being payed off with experience learned, he's going to keep trying! The bees got a little creative with these frames. Anyone for round interior walls? Lots of finger-licking, snitching and lip smacking going on in this process! Yu-um! He got the extractor out, (see the big round metal thing?) but I don't think he ever used it. 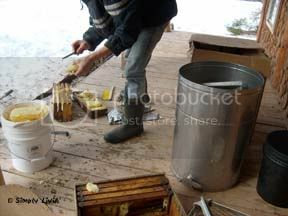 He's been extracting the honey out slowly, warming the honeycombs on the stove and running the honey out through a strainer. This year, we're going to try and get local bees who know about winters. See, it's all in the accent. We've learned our lesson. From now on, we're not going to lay down cash for any bee that doesn't greet us with an, "oh, how's it goin' eh?" greeting. That's right! 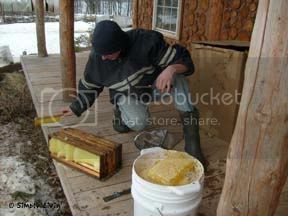 Yooper bees wouldn't freeze and starve at the first snow. You'd see them snapping their little earflap hats under their chins and buzzing out into the woods with a 22' to shoot a buck for their colony's dinner. Back to the topic at hand--apparently Andrew was processing some honey comb in the kitchen, which left a pile of dead bees on the table, which after cleanup, left a few in the sink. So that's the long and short of why I had bees in my sink. BTW, If any of you locals know of any bees with yooper accents, or more likely, apiaries owned by beekeepers with yooper accents, we're in the market! We need to get our spring hives ordered now. --Oh, and for the record, the cows want everybody to know that they were right--winter's back... much to the little thermometer's chagrin.